The first-class standard of care provided by a Telford care home has been recognised with its staff becoming respected Dignity Champions. Earlier this year, Myford House Nursing Home in Horsehay was visited by the Safeguarding team from Telford & Wrekin Clinical Commissioning Group as part of their Dignity Day Road Trip initiative – a scheme aimed at raising awareness of dignity in care and enrolling Dignity Champions who look to maintain care standards. 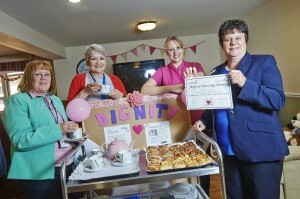 Now three months on, the home has been presented with a certificate with seven staff signing up as Dignity Champions after showcasing their care and wellbeing approach. Kerry Young, Activities Manager at Myford House, said: “To get the certificate and to be recognised for how we treat patients is vitally important to us and we are delighted seven of the team have signed up as new Dignity Champions. The Dignity in Care campaign is led by the National Dignity in Care Network, who work together to place greater emphasis on promoting the work Dignity Champions do to improve standards of care. The Safeguarding team from the Shropshire Clinical Commissioning Group, and staff from Shropshire Community Health Trust, were also part of the Dignity Day Road Trip. Tea and cakes were served during the visit with everyone joining in to sing old-time songs including “We’ll Meet Again” and “The White Cliffs of Dover”. Dignity-related poems were also read out. Myford House is an exclusive development registered for 57 residents who want to spend their retirement in privacy and comfort. Situated on the edge of Lightmoor Village, it offers 24-hour care, quality accommodation to meet the needs of elderly adults and provides the setting for long or short stays, whether for personal, respite or convalescent care.